The remains of Richard de W’Peton, a medieval priest who died 700 years ago – on 17 April 1317 – have been uncovered in an elaborate grave. Archaeologists from the University of Sheffield made the rare find at Thornton Abbey in Lincolnshire, which was founded as a monastery in 1139 and went onto become one of the richest religious houses in England. The priest’s gravestone was discovered close to the altar of a former hospital chapel. Unusually for the period, it displayed an inscription of the deceased’s name, Richard de W’Peton – abbreviated from ‘Wispeton’, a medieval incarnation of modern Wispington in Lincolnshire – as well as the date of his death. The discovery of Richard’s grave was made by University of Sheffield PhD student Emma Hook, who found his skeletal remains surrounded by the decayed fragments of a wooden coffin. “After taking Richard’s skeleton back to the laboratory, despite poor preservation, we were able to establish Richard was around 35-45 years-old at the time of his death and that he had stood around 5ft 4ins tall,” said Emma. “Although he ended his days in the priesthood, there is also some suggestion that he might have had humbler origins in more worldly work; his bones show the marks of robust muscle attachments, indicating that strenuous physical labour had been a regular part of his life at some stage. 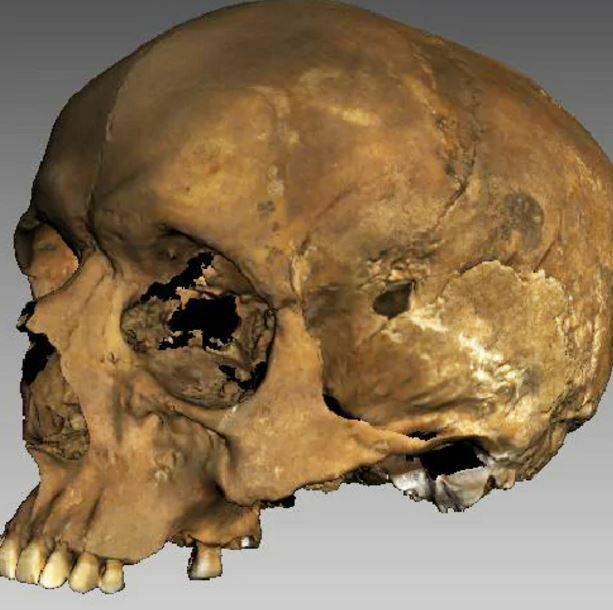 In order to further investigate Richard’s health, researchers in the Department of Archaeology produced a 3D scan of his skull. The model produced enables detailed features of the skull to be seen with much more ease than with the naked eye. This revealed a potentially violent episode in the priest’s past: a slight depression in the back of his skull shows evidence of an extremely well-healed blunt force trauma suffered many years before Richard’s death. None of the investigations shed light on the cause of his demise at a relatively young age, however there is one possibility that researchers are exploring. Dr Hugh Willmott from the University of Sheffield’s Department of Archaeology, who has been working on the excavation site at Thornton Abbey since 2011, said, “2017 marks not only the 700th anniversary of Richard’s death, but also that of a catastrophic event that is now largely forgotten, but caused years of suffering for the whole of Europe: the Great Famine of 1315-1317. Triggered by a whole spring and summer of relentlessly heavy rain that caused widespread crop failures – which vastly depleted the availability of grain for humans and hay or straw for animals – this was a period of mass starvation. He added: “By spring 1317, when Richard died, the crisis was at its peak and its events would undoubtedly have affected medieval hospitals like Thornton Abbey, and the priests who served there. “These institutions traditionally cared for the poor and hungry as well as the sick, so during the Great Famine sites like Thornton would have found themselves on the front line. Richard would have ministered to the starving, working in the face of desperately limited resources – and perhaps despite these efforts, he too succumbed to the natural disaster that was unfolding around him. This is the latest significant archaeological find at Thornton Abbey in Lincolnshire. Last year a mass burial of bodies, known to be victims of the Black Death, was discovered at the hospital. A total of 48 skeletons, many of which were children, were found by the excavation team including PhD and undergraduate archaeology students.